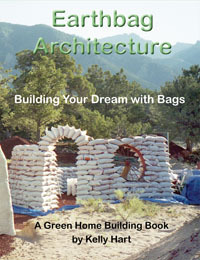 This article explains the basics about building an earthbag home. Earthbag building has evolved from 100 years of building military structures out of sandbags. Modern-day builders are using the same basic process of filling, tamping and stacking bags to construct beautiful homes, offices, shops, orphanages, schools and a wide variety of other structures. Earthbag buildings are sustainable, nontoxic, quiet, rodent proof and fire, hurricane and flood resistant. They are even bullet and blast resistant. Clear, level and prepare the building site. Remove and save topsoil for gardening and landscaping. Stake out the project with string and wood stakes. Bury plumbing and electric according to safe building practices. Stockpile soil and gravel around the site in such a way as to minimize labor. Build a rubble trench foundation by digging a trench a little wider than the earthbag walls and about 18"-24" deep. Add gravel in the trench, leaving 6"-12" of space on top for 1 or 2 courses of earthbags. In other words, you want 1-2 courses below grade. Add several courses of gravel-filled bags to prevent moisture damage to earth-filled bags. This involves filling one bag at a time about 3/4 full with gravel and tucking the end underneath. Tamp and level the bags after each course is complete. Add 4-point barbed wire between each course for tensile strength. One strand may suffice for vertical walls on a small home. Two strands are recommended for domes and vaults. Extend the wire about 18" extra and connect with tie wire (baling wire). While you could obtain your fill soil by digging on-site, having it delivered by the truckload will save countless hours of hard work. Most subsoils will work. Earthbag builders are using road base, reject fines, adobe soil or fill dirt.